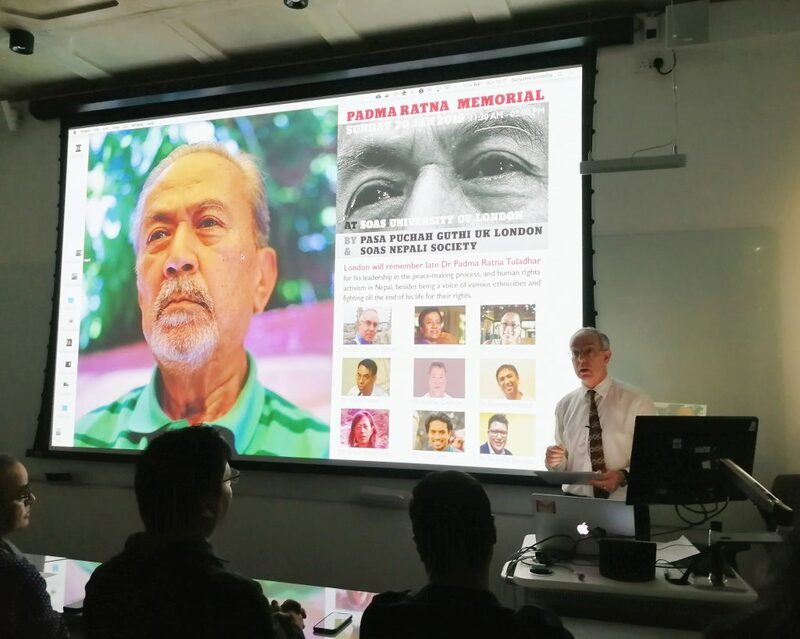 Pasa Puchah Guthi UK (PPGUK) London & SOAS Nepal Society jointly organised a memorial event to commemorate the life and contributions of late Dr Padma Ratna Tuladhar on Sunday 20th January 2019 at SOAS University, London. The event attended by 30 guests, including university students of various subjects related to social anthropology and politics of Nepal, was attended by representatives from the Embassy of Nepal in London. Fifth speaker of the event, former president of PPGUK and Vice-President of World Newah Organisation, Mr Krishna Chakkun highlighted on Padma Ratna’s contributions towards the worldwide networking of Newah community. He informed about the history behind formation of World Newah Organisation through an international convention in London in 2011, and Padma Ratna’s role in the historic achievement. After a short refreshment break, sixth speaker, former president of PPGUK London Dr Sachetan Tuladhar shared his valuable experiences with Padma Ratna Tuladhar as a family member. He revealed lesser known facts about Padma Ratna’s personality as a quiet yet humorous person at home.